This paper looks at the artificially induced surface conversion of calcium carbonate to the more durable calcium oxalate. Extensive research is being carried out on wall paintings and marble sculpture at the Opicificio delle Pietre Dure e Laboratori di Restauro in Florence, Encouraged by their work, I have researched the effectiveness of the conversion on English limestones. The treated samples have been compared to untreated samples for appearance, hardness, resistance to acid and alkali, porosity, and durability. The results have been assessed considering ease of use, effectiveness, and the appropriateness of the treatment. Stone, already millions of years old when quarried and manipulated for our own needs, would appear to be impervious to decay. Like all matter, however, decay is inevitable and ongoing. Crystallization of soluble salts within the stone, attack of acid gases in the air, and cycles of freezing and thawing are three interrelated decay mechanisms. Pollution exacerbates the problem of decay. Some stones are more resistant to attack while others are extremely vulnerable. Limestones, calcareous sandstones, and marble are among those at high risk. Although environmental control would appear to be a solution, the issue is complex; air pollution can never be completely eliminated, nor can all stone that is at risk be removed to a less hostile location. When alteration of the environment is not a suitable option, protective treatments are often applied directly to the surface of the stone. In the search for a sympathetic surface treatment, many materials have been tried with varying degrees of success. Waxes and oils, used extensively in the past, discolour the surface, attract particulate pollutants, are difficult to remove, and may render the surface impermeable. Solutions, such as lime water, believed to strengthen decaying stone by the addition of sound calcium carbonate, have not been proven to be entirely effective. Shelter coat is intended to provide a sacrificial layer, decaying preferentially to the stone itself. Many protective treatments are unsightly and some are often more damaging to the stone than the decay itself, so the search continues. The natural conversion of calcium carbonate to calcium oxalate has led to experiments in Italy using an artificially induced conversion to protect stone and lime plaster. The treatment relies on the controlled use of a naturally occurring chemical process. Calcium oxalate created in a controlled way would appear to be protective and sympathetic to the existing matrix. Encouraged by the extensive work being done at the Opificio delle Pietre Dure in Florence on the surface conversion of stone and wall paintings to calcium oxalate, I have researched the effectiveness of the conversion on English stone. The treated samples were compared to untreated samples and samples treated with lime shelter coat for appearance, hardness, resistance to acid and alkali, porosity, and durability. It is hoped that both the control and treated samples will be examined with a scanning electron microscope (SEM) to determine if the reaction has taken place and Fourier Transform Infrared spectroscopy (FTIR) to find the depth of conversion. The results were assessed considering ease of use, effectiveness, and the appropriateness of the treatment. By conducting trials on a range of commonly used local limestone it may be possible to discover if surface conversions, carried out successfully on marble and lime mortars in the Italian trials, will prove to be an appropriate treatment for stone in the United Kingdom. Preliminary testing does, by necessity, limit the scope of the project, but has, hopefully, provide the essential ground work for further investigation. The major causes of the decay of stone are soluble salt crystallization, frost action, and the attack of acid gases in the air. Our control of the levels of acid gases in the air and the protection of stone from the damage caused by them is one decay mechanism where we may intervene with some positive impact. Although we may be able to control, to some degree, the production of new salts, we have little control over existing salts and salts being carried through ground water and the air. Nor are we able to control external fluctuations in temperature and humidity. Thus, it is most important to look at how acid gases in the air react with limestone to cause damage. Understanding the cycle of degradation caused by acid gases may eventually lead to a treatment that protects limestone from the decay mechanisms that are beyond our control, while not being problematic for the stone itself. Air contains nitrogen, oxygen, argon, and carbon dioxide (Atkins 1989). Acid based gases, formed naturally and from the burning of fossil fuels and volcanic activity, are also present along with particulates of carbon and tar. Particulate pollution causes dirt and staining while acid-based gases can cause the break down of the stone itself. Sulphur dioxide gas, formed when sulphur burns in air, is the most significant cause of acid gas degradation. When the gas is dissolved in water, from either moisture in the air or rain, dilute sulphurous acid is formed. Sulphurous acid combines with oxygen to form sulphuric acid. When the acid is deposited on calcium carbonate the surface of the stone is converted to calcium sulphate. Calcium sulphate takes up water as it crystalizes to the mineral gypsum (Ashurst & Dimes 1990). Being a slightly soluble compound, gypsum, along with dirt, is washed away by rain, leaving the surface of the stone clean but slightly eroded and vulnerable to further decay. In sheltered areas the sulphuric acid condenses on the stone, reacts with it, and binds in particulate pollutants, forming a black crust on the surface. Some durable limestones can retain this unsightly gypsum crust indefinitely, while less durable ones form blisters which eventually burst leaving powdery decayed stone behind. In time the decayed stone falls off leaving fresh limestone exposed to further decay (Ashurst & Dimes 1990). Figure 1: Architectural detail showing gypsum crust, blistering, and decayed limestone. This cycle of decay is cause for concern as decorative detail is lost and eventually the structural integrity may be compromised. No permanent solution to the problem has been found and the cost of the damage can be staggering. The most effective way to slow decay would be to change our environment and this has been done to a great degree as more stringent pollution abatement regulations have been put in place. Although the air in the United Kingdom is lower in sulphur dioxide gas since the introduction of these regulations in the 1950s, much of the damage we see today is a cumulative effect of past pollution in the pores of the stone. The degradation of stone caused by acid deposition, although slowed, can never be stopped entirely even if all industrial pollutants were removed. A positive solution entails moving pieces to environmentally controlled shelters and, where feasible, replacing the original with reproductions. This is not always possible or desirable and the problem becomes more complex with buildings and the sculpture and wall paintings that are an integral part of their structure. In these cases protective surface treatments are often employed. Many rely on the introduction of a surface skin that is intended to enhance durability and provide a transparent shield from the abuses of the environment, but the porous nature of limestone and lime mortars can make this a difficult task (Matteini, et al. 1994). Buildings and wallpaintings, unlike much sculpture in the round, are not only vulnerable to attack at their surface but are often unprotected from moisture and salts rising from the ground below. Slightly soluble salts do the most damage as they expand below the surface and can push the surface off. Very soluble salts usually effervesce at the surface and can be brushed off. Insoluble salts stay either on or below the surface (Matteini 1987). A protective skin that is impervious to water can put extreme stress on the stone. When moisture carrying soluble salts cannot pass through to crystallize on the surface they build up below until the pressure of crystallization forces off the coating. In its aqueous state salt moves through the porous stone. When dry the crystals, which occupy more space, exert pressure on the pore walls. Their pressure can often exceed the strength of the wall causing damage to it. The factors that determine the severity of the damage are the size and shape of the pores, the quantity and the type of salt present and its internal location. Salts deep within the stone cannot be washed away and if they continue to accumulate damage may occur. Organic materials have customarily been used for surface coatings and consolidants on stone. Waxes and glues have been used extensively in the past and in this century we have seen the introduction of synthetic resins. Some organic materials form films that neither allow liquid nor vapour to pass through. These coatings are referred to as occlusive. Occlusive coatings can form small fissures and cracks on the surface which, over time, encourage the migration of salts to it, but as adequate egress is not provided surface damage can occur. Other coatings are water repellent and transpiring, only allowing the movement of vapour. Transpiring coatings hold the interstitial water behind the treated layer until it evaporates. Salts held in solution tend to accumulate where evaporation takes place. The salts and other contaminants build up over time and the pressure they exert can lead to the mechanical breakdown of the material (Miller 1993). Stone is hydrophilic. Water is taken up at the surface, from adjoining stones and from the ground. Water repellent coatings have been favoured for their reversibility but may cause more damage than no coating at all. In seeking an appropriate surface coating for stone the nature of the matrix must be taken into account and the chosen coating must be compatible with it. Compatibility, in this case, assumes that no moisture barrier is formed preventing soluble salts from migrating freely to the surface. Ideally the coating, while maintaining the hydrophilic features of the stone, will provide protection from environmental damage. Many different coatings have been tried with varying degrees of success. Shelter coating, as it is commonly used in the UK, meets the first and most important requirement of being sympathetic to the existing matrix. A standard shelter coat is a slurry of slaked lime, fine sand and stone dust in water to which casein and formalin have been added. The mixture is applied to fully conserved masonry to fill in the small crevices and depressions caused by decay and to form a protective coating over the entire surface, acting as a sacrificial layer against future attack. Despite the problems of appearance often associated with shelter coating it remains a popular option and its popularity is an affirmation of its safety. It has, however, no enduring effect. Its main constituent, calcium carbonate, is as subject to decay as the stone itself and the coating is eventually washed away by rain leaving the stone unprotected and exposed again. Shelter coats are usually applied when major conservation work is done. The coating may last for ten or fifteen years but major conservation may only be undertaken every hundred years, so, unless applied regularly, any protection offered is negligible. While shelter coat is not believed to be harmful to stone and does offer some degree of protection, it can detract visually from the surface and it is by no means a long term solution. The calcium oxalate patina called scialbatura is found not only on calcareous building stones and mortars but on natural outcrops of limestone and marble (Lazzarini & Salvadori 1989). The study of the naturally formed patina has led to investigation into its controlled use as a protective treatment for marble and lime mortars. The patina consists mainly of calcium oxalate which exists in two forms: monohydrated whewellite and dehydrated weddelite. Both are chemically pure, although impurities are bound up in the crust during their formation. Calcium oxalate is itself colourless but when organic fragments, mainly lichen, and inorganic fragments of quartz, feldspar and other minerals are present they give the patina a yellowish brown colour. The colouring and impurities must be eliminated when creating an artificially induced patina. Natural formations of calcium oxalate on calcareous stone can penetrate deeply in an intergranular position or along microfractures. Whole calcite crystals are isolated creating a mixed metasomatic oxalate/calcite band. There is no clear separation between the carbonates and oxalates, thus making it difficult to detect in cross-section (Del Monte & Sabbioni 1987). The transformation layer can be less than 100 µm thick, but also may exist as a heavy incrustation. Calcium carbonate is significantly more soluble than calcium oxalate at pH 7. The solubility of the carbonate increases until pH 5, beyond which irreversible decomposition occurs (Matteini & Giovannoni 1996). In the absence of pollution, rain has a pH of 5 and dilute sulphuric acid can be expected to have a pH of 3 or less. Thus the oxalate is far more acid resistant and not as susceptible to the degradation caused by acid gases. Oxalic acid reacts with calcite to form, over centuries, a thin calcium oxalate membrane. Lichens are one source of oxalic acid, but the patina may not be caused exclusively by lichen. Not all varieties of lichen produce oxalic acid, while fungi and bacteria can also be sources of the acid. Polysaccharides and lipids, the possible result of a purposeful application, can combine to form oxalates as well. Oxalic acid can also be produced through the transformation of hydrocarbons from industrial areas, thus it is possible the patina could even be the result of air pollution (Ford, et al. 1994). There appears to be considerable debate about how the crust is formed. Theories ranging from the activity of lichen and other micro-organisms to electrical storms as the source of calcium oxalate (Ford, et al. 1994). Scialbatura in its natural form may be the "skin" that is found on unworked stone. The patina is removed by working the stone and takes centuries to reform. There appear to have been purposeful attempts to encourage the formation of the patina in antiquity. An examination of Trajan's column found the patina evenly distributed over the entire surface, which may suggest an intentional application. The original surface is so well preserved that the maker's tool marks can be seen under the patina (Del Monte & Sabbioni 1987). The patina was also found on the stone, marble and bronze doors at the Church of St. Zeno in Verona. As there is evidence of brush strokes and no lichen present, it is also considered to be an artificial application. The impetus for this study has been the work being carried out at the Opificio delle Pietre Dure in Florence. Dr Matteini and his colleagues, faced with the problem of protecting wall paintings from atmospheric pollutants, while maintaining their delicate physio-chemical balance began to look at the naturally occurring calcium oxalate patina that had been found on wall-paintings, stone and other works of art. The use of oxalic acid in the trials was eliminated as the pH is too low, causing damage to the surface of the stone. As it is possible to synthesize calcium oxalate by reacting calcium carbonate with free oxalic ions, a double exchange reaction using ammonium oxalate was chosen. 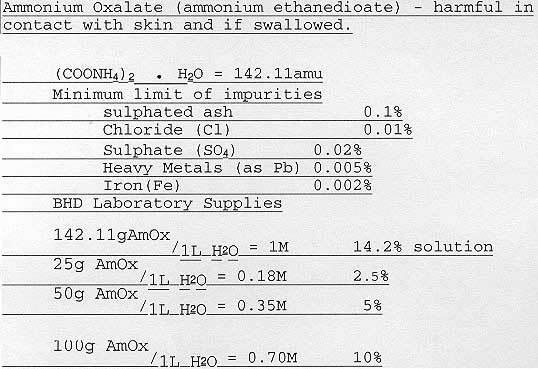 Ammonium oxalate was suitable, for when dissolved in deionized water it has a neutral pH. Ammonium carbonate, the secondary reaction product, spontaneously decomposes. The reaction is a typical heterogeneous one between a solid static phase and migrating liquid phase and is dependent on temperature, concentration, the surface of the reactant and the flux of the liquid in relationship to the solid. Laboratory tests were performed on samples of naturally aged painted and unpainted lime plaster and marble. All the samples were treated at room temperature with a saturated solution of ammonium oxalate in a cellulose poultice applied over Japanese tissue. On plaster of Paris samples it was found that the conversion from calcium sulphate to calcium oxalate occurred even more readily than the conversion from calcium carbonate. This conversion would seem to insure that sulphate impurities are no longer a factor in deterioration. Matteini concludes that the slightly soluble sulphate is transformed to the insoluble oxalate and the ammonium sulphate salt is partly absorbed in the poultice and the rest diffuses in the bulk of the plaster. Since the quantity of gypsum below the surface is small, the transformation dilutes the sulphate impurities to minimal values and they are not a factor in further deterioration (Matteini & Giovannoni 1996). Visually, the treated samples remained unchanged but surface morphological SEM examination showed significant differences between the calcium oxalate and carbonate crystals. Crystal size and morphology are different in the treated samples. The rounded CaCO3 crystals became extended as a result of the treatment with ammonium oxalate. Figure 2: SEM examination (2300x magnification) shows significant crystal modification between (a) untreated and (b) treated samples. The rounded CaCo3 crystals become extended as a result of the treatment with ammonium oxalate. The depth of the transformation of about 10 microns was confirmed by Fourier Transform Infrared spectroscopy. No added surface layer was produced because the transformation occurs at the expense of the calcium carbonate, it is the surface of each calcite granule that has undergone conversion. Applications of acids of varying strengths and concentrations were applied to the plaster and marble samples. Effervescence occurred on the untreated samples but the acids were absorbed with almost no effervescence by the painted plasters and remained at the surface of the treated marble for considerable lengths of time. A 2% solution of hydrochloric acid did, however, cause erosion on the treated samples. SEM confirmed that the superficial micro-structure becomes more compact because the oxalate is denser than the calcite. Porosity is only slightly diminished, however, and this is limited to the outermost portion of the calcite granules. The mean absorption time of drops of water applied to the samples were measured. "Increase of the mean absorption times of the drops on treated areas shows a reduction only of porosity. At the same time, the wetting and hydrophilic properties are retained." (Matteini, et al. 1987). Having determined the possible efficacy of the treatment using a 5% solution for a minimum of five hours, in situ treatment of small "artistically unimportant" areas of objects were carried out (Matteini & Giovannoni 1996). The marble Donatello Pulpit in Prato was included in these trials. A laser was used to remove the gypsum crust and previous coatings from the surface prior to treatment. Matteini (1996) said the gypsum must be removed or the converted surface may appear opaque. Organic resins must also be removed if the reaction, an ion exchange mechanism, is to occur. The calcium sulphate below the surface was converted, thus reversing an important step in the cycle of decay and thorough precleaning insured that the visual effect was good. One might well argue the ethics of the permanent surface conversion of calcium carbonate to calcium oxalate. The oxalate film was removed from the Ghirlandaio frescoes with the application of ammonium carbonate poultice, which may beg the question of reversibility (Bandini, et al. 1986). Assuming reversibility on stone were not possible, it could also be debated that organic coatings are never entirely reversible either and can, ultimately, be more harmful to the stone than a naturally occurring conversion that is sympathetic to the existing matrix. We must, however, put ethics aside for the moment and look at the advantages and disadvantages of the Italian findings as this data will have a direct bearing on the ensuing ethical debate. The pH, concentration, and reaction time make this a feasible treatment for in situ application. No difference in chromatic variations and light reflectance has been observed. The refractive indices (RI) of the painted surfaces tested were unaltered. The hydrophilic and wetting properties are retained after treatment. A slight reduction in surface porosity is observed but the passage of water is not prevented. Salts are not trapped below the surface as there is ample egress. The treated surface is considerably more resistant to acid attack. Further treatments and desalination are possible. A slight increase in cohesion is observed after treatment. The cost of the treatment is low. Ammonium affects copper based pigments such as malachite, verdigris, and azurite. The heterogeneous nature of the reaction determines its spontaneous termination only a few microns below surface. "It is likely that the pores are lined with calcium oxalate crystals which slow down the propagation of the reaction towards the interior" (Matteini & Giovannoni 1996). With information on calcium oxalate and the data from the Italian trials it was possible to map out a basic procedure and to have an idea of what could be expected. I have, however, learned to expect the unexpected. Although the procedure for trials and the tests to be performed on calcareous stones common to the United Kingdom was seemingly straightforward, the results have been less so. It was decided to conduct the trials on three commonly used stones covering a range of colours, hardness, and porosities. Portland, Purbeck, and Topbed were chosen. Portland, ranging from a light cream colour to a dazzling white, has a close and even texture making it excellent for carving. It was chosen for its durability and popularity among British builders and carvers. Purbeck limestone, often referred to as marble, can be highly polished, therefore, like marble, is usually used decoratively. Unpolished it is a light grey but darkens almost to black when polished. If the treatment were to have an opacifying effect on the surface, it would be clearly evident on a dark coloured sample. Selected for its softness and higher porosity, Topbed is a cream to buff coloured stone which mellows to a honey colour with age. Tests were also carried out on plaster of Paris, as the samples could easily be tested for hardness and the conversion layer tested for sulphates. Most of the tests were intended to be simple so that they could be carried out in the City and Guilds of London Art School laboratory or at home. By comparing the results of the treated samples to the controls, it was possible to determine if a reaction had taken place, if change in appearance had occurred, acid resistance improved, porosity affected, and if greater hardness had been achieved. More sophisticated analysis (SEM and FTIR) will be required to identify the materials present and the depth of the conversion. The selected stones were cut to a workable size and steam cleaned. They were weighed and the density calculated before being labelled and numbered. Plaster of Paris samples were made using local tap water. It was found during the Italian trials that the reaction had successfully been achieved at room temperature using a saturated solution (5%) of ammonium oxalate in a poultice left on for a minimum of five hours. As a starting point it was decided to follow the same procedure on one of each of the stone and plaster samples. Additional Portland samples were poulticed in a 2.5% ammonium oxalate solution for five hours, a 10% solution for five hours, and a 5% solution for ten hours to determine if any significant differences could be found. Japanese tissue was placed over the samples and the wallpaper paste poultice prepared to the consistency of a thick gel and applied. The samples were placed in numbered plastic bags and the times recorded. When the poultices were removed from the samples they appeared to be quite discoloured and shiny. After drying the appearance was only slightly improved. Wetting revealed that a substantial amount of wallpaper paste remained on the surfaces. This was removed by washing the stones in deionized water and wiping the plaster samples with cotton wool wetted in deionized water. Again the samples were allowed to dry. When dry it was clear that the shiny wallpaper paste residue had been removed, but all the samples were still quite discoloured. The stone samples, with the exception of the Purbeck, which was noticeably darker than the control, had a distinguishable rust colour, the depth of which appeared to relate directly to the time and concentration of the solution used. Reviewing the procedure it seemed possible that the fungicide in the wallpaper paste may have caused the colour change. As no information on the type of fungicide used in the pre-packaged wallpaper paste was available, an element of doubt remained and it was decided to repeat the procedure using a different poultice. It was also decided to immerse one sample directly into the ammonium oxalate solution for five hours. Immersion would make it possible to determine if the poulticing medium had been responsible for the colour change. 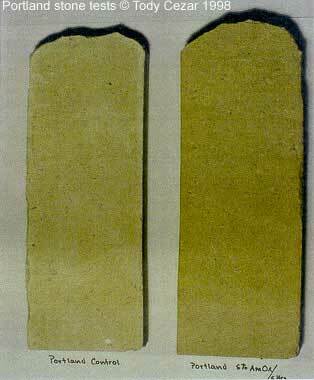 Figure 3: Portland stones (left) the control and (right) treated with a 5% solution of ammonium oxalate in paper pulp poultice paste for five hours. The next attempt was made using paper pulp. Application times and solution concentrations were the same as before. Discolouration was still evident on the dry samples, including the one that had been immersed, thus eliminating the poultice as the source of discolouration. It was now necessary, however, to determine what the colour was and to look for other possible sources of its formation. A powder sample was taken from one of the portland blocks and was dropped in HCl to which a few drops of sodium thiocyanate were added, the solution turned red, although not the bright red expected, indicating the probable presence of the less soluble Iron II oxalate. To test if Iron III had been reduced to Iron II by the ammonium oxalate the test was repeated but at the end hydrogen peroxide was added. This acted as an oxidizing agent and the colour was restored to the deep red as expected. This test indicates that the staining on the stones is iron. As iron staining had not been a problem in the Italian trials, it was assumed that a procedural error may have occurred. In hopes of solving the problem more stone samples were cut, some were steam cleaned and one was not, all were treated with a 5% solution of ammonium oxalate in a paper pulp poultice for five hours, the discolouration still occurred, although somewhat less on the piece that had not been steam cleaned. To further test if steam cleaning was a factor in the migration of iron to the surface a Portland control was steam cleaned and a plain deionized water paper poultice was applied for five hours, a very slight colour change was apparent. This test, however, cannot be considered conclusive evidence that steam cleaning was a factor in the iron staining. Some stones may have become more saturated than others in the cleaning process and staining was also apparent on the stone that had not been steam cleaned. As the stone used in these trials are sedimentary rather than the metamorphic stone (marble) used in the Italian trials it began to seem that the conversion of sedimentary limestones without a colour change may not be possible. These stones not only have a higher iron content but because of their geological formation are structurally different and may, in fact, respond quite differently to the treatment. A complication of this magnitude very early in the study changed the direction of the work. Attempts to find some answers to the problem of discolouration had to be pursued at the expense of other tests, as the final appearance of the treated stone is an important consideration in any trials. Further tests were carried out in an effort to determine the possible cause of the staining. A piece of marble and a naturally aged piece of Portland were both cleaned with acetone and half of each piece was treated with a 5% ammonium oxalate solution in a paper pulp poultice for five hours. The old stone clearly showed discolouration while the marble did not. It would appear that ammonium oxalate may act as a chelating agent. As soluble iron is drawn forward it, along with the calcium carbonate, reacts with the ammonium oxalate and two products, calcium oxalate and iron oxalate, are formed. Due to the problems encountered it was decided to limit the preliminary testing to the Portland samples to determine if the conversion to calcium oxalate had taken place and if the iron oxalate, that had been inadvertently formed, would have any effect on the intended results. A treated and a control piece of Portland were subjected to a range of acids (pH 1-5) and a strong alkali (pH 12). Measured drops of the acid and alkali were applied to both samples. It was clear from the tests that the surface of the treated piece had undergone a chemical change. Resistance of acids of pH 3 and above could clearly be seen, and protection from alkali of pH 12 and below appears to have been provided. 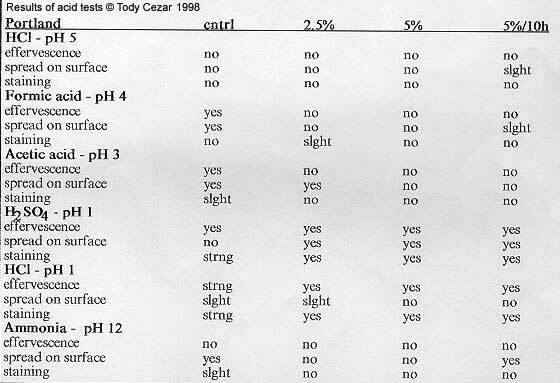 Table 1: Results of the acid tests on Portland treated for five hours with 2.5% and 5% solution and one treated for ten hours in a 5% solution of ammonium oxalate. 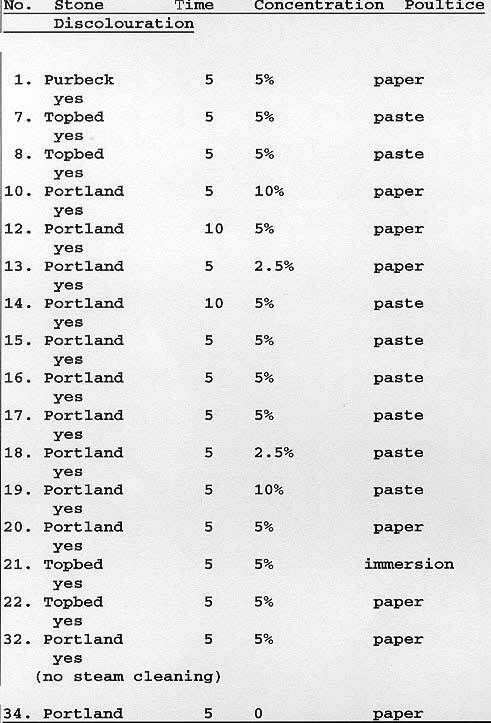 Figure 4: Results of the acid tests on Portland control and Portland treated with 5% ammonium oxalate for five hours. Treated and untreated plaster of Paris samples were each placed in 300 ml of deionized water and left for 24 hours. The surface of the treated sample had degraded and a white powder could be seen at the bottom of the jar. Closer examination of the sample, after removal from the water, revealed that much of the crust that had been formed had been pushed off by the wet and expanding plaster below. 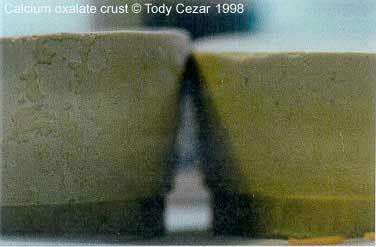 Figure 5: Calcium oxalate crust (left) formed on the Plaster of Paris sample. 100 ml of the water used to soak each sample was poured off and tested for sulphates. Tests indicated that comparable amounts of sulphate ions were present in both samples. Sulphate tests were also done on scrapings from the same plaster samples. The crust was removed from the treated sample, being careful not to include any of the unconverted plaster below. Both samples were soaked in deionized water for 24 hours and then tested as above. Merkoquant strips indicated the sulphate content of the test water from the control was over 1600 ppm. The water from the crust of the treated plaster contained only 400 ppm. Once again it was evident that a change had occurred but only further research can determine the significance of this conversion. The test was carried out on two plaster of Paris samples. Pencils B - H (seven pencils) were tested on the control and one treated with a 5% solution of ammonium oxalate for five hours. The softest pencil marred the surface of the control, while six progressively harder pencils were tested before the treated sample was marred by an H pencil. Table 2: Results of the pencil hardness test. Water drop absorption tests were carried out to measure changes in the porosity of the stone surface after treatment. The mean time for water absorption on the control sample was slightly over five minutes, the times for absorption on the treated samples was at least twenty times more. These times are considerably longer than those observed by Matteini; their findings, he felt, only reflected a reduction in porosity and not a loss in wetting and hydrophilic properties (Matteini, et al. 1994). In this case the decrease may also constitute a loss in wetting and hydrophilic properties. Reduction in porosity could be due to the increased amount of iron and other soluble matter that has migrated towards the surface or a change in the superficial micro-structure of the stone. 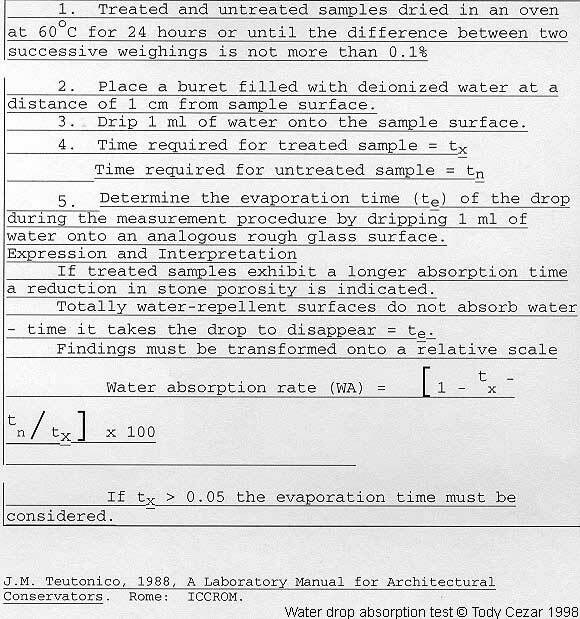 Table 3: Absorption times (in minutes taken from 5 measurements) of 1 ml drops of water applied to the surface of Portland stone treated with varying concentrations of ammonium oxalate with different contact times. Researchers at the British Research Establishment have found that stone exposed to normal external conditions will show signs of deterioration in just six weeks when examined under SEM. Two pieces of each control and treated sample of Purbeck and Topbed were cut. Shelter coat was applied to two Portland and two Topbed control samples. The samples were placed on south east and north west ledges respectively at a site in central London where they remained for eight weeks. No visual degradation was apparent when the samples were removed but SEM will be necessary to determine if there is any difference between the treated, shelter coated, and control samples. Table 5: Placement of test piece for outdoor aging tests. It had been hoped that accelerated aging tests could be conducted using sulphur dioxide, but as safe and controlled conditions could not be guaranteed, a simple but far less effective alternative was chosen. Samples, precut for SEM, were placed in a sealed jar containing a vial of 2.5 molar sulphuric acid and a vial of water. The jar was placed in a warm sunny location for six weeks in hopes that the condensation of both liquids would create an acid environment. As the vapour pressure of sulphuric acid is too high for evaporation to be likely to occur under these conditions, the results of this test would appear to be unsatisfactory. SEM, however, will be required to determine if any change has taken place. Transformation to calcium oxalate: Although the samples have not yet been analyzed to determine if calcium oxalate has actually been formed and the depth of the transformation, it is quite clear from the test results that the treated stones have undergone a chemical change. Application: The contact time of five hours using a gel poultice would make this a simple and cost effective treatment for building stone and sculpture. Appearance: The colour change caused by iron staining, although minimal in the sample that was not steam cleaned, is cause for concern and effectively rules out the use of the treatment for in situ trials for the time being. Resistance to acid and alkali: A definite resistance to acid and alkali was found on the treated samples. For this reason alone further exploration would appear to be warranted. 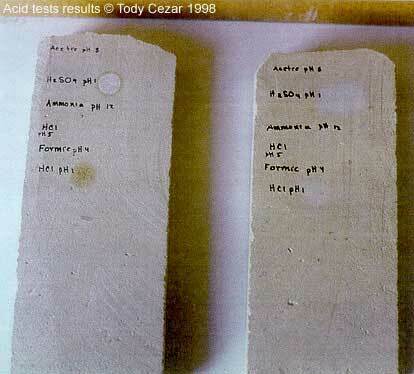 Hardness: Increased hardness was apparent on the plaster of Paris samples. If increased hardness can be determined on the stone samples the advantages will have to be measured carefully against the possible disadvantages. Porosity: There would appear to be a significant reduction in porosity of the treated samples. If this decrease is found to have a detrimental effect on the wetting and hydrophilic properties of the stone, the migration of soluble salts to the surface would be impeded and damage could occur. The resolution of the problem of iron migration may be a factor in increasing the water absorption times and further work will be required. Durability: Visual changes in the aging tests samples were not apparent. It is hoped that SEM analysis can be an aid in determining if durability has been enhanced. Antisulphation action: A crust visible to the eye could be seen when a plaster sample was soaked in deionized water. Rudimentary testing showed a sample taken from the crust to be far lower in sulphates than a sample taken from the control. More sophisticated analysis would be required to determine if the surface of the treated plaster samples have actually been converted to calcium oxalate. I could not have completed this project without the support of my friends and classmates. In addition, I would like to give special thanks to Dr. Matteini for his encouragement and continued support; my able friends from the City and Guilds of London Art School's Architectural Stone Carving Course, Simon Smith, Paul Jakeman and Panico Theodosion, for helping me gather the samples I needed and cutting them into dangerously small pieces; Dr. Ian "Chemistry" Jones for helping me understand what I was doing; and especially my tutor, Jennifer Dinsmore, for her kind assistance and boundless patience. Ashlar - a square block of building stone, finished or rough. Decay - significant loss of substance or form. Heterogeneous - individual components of a substance lie in distinct regions, even on a microscopic scale. Hydrorepellent/transpiring protective coatings - inhibit the transfer of water in the liquid phase but allow the passage of water in the form of vapour. Interstitial - situated in the intervening spaces of a structure. Metasomatism - the process whereby minerals or rocks are replaced by others of different chemical composition as a result of the introduction of material from sources external to the material undergoing change. Morphology - the study of form and structure without regard to function. Occlude - to absorb and retain gases or liquids in minute pores. Occluding protective coatings - physically obstruct the pores which are the main channel to the exterior. Oolite - 1. a limestone composed of minute rounded concretions resembling fishroe. 2. an upper division of the European Jurassic largely composed of oolitic limestone. Porosity - the ratio of the volume of pore space to the bulk volume. Transpire - to escape through pores, as vapour. Weathering - all changes that occur. Ashurst, J. and Dimes, F.G. 1990. Conservation of Building and Decorative Stone. Vols. I and II. London: Butterworth. Atkins, P.W. 1989. General Chemistry. New York: Scientific American Books. Bandini, F., Botticelli, G., Danti, C., Matteini, M., and Moles, A. 1986. "The restoration of D. Ghirlandaios Frescoes in the Cappella Maggiore of S. Maria Novella in Florence: Problems, practical works, results." In: Proceedings of IIC 11th International Congress. Bologna, Sept. 1986. Bologna: IIC, 186-189. Bath Stone Group 1996. Information on Topbed from their brochure. Building Effects Review Groups Report 1989. The Effects of Acid Deposition on Buildings and Building Materials in the United Kingdom. London: Her Majesty's Stationary Office. Burnstock, A. 1997. "Introduction to the methods for the analysis of pigments an plasters - An overview." Paper presented at the conference The Analysis of Pigments and Plasters. British Museum, 22 February 1997. Butlin, R., Yates, T., Murray, M., and Paul, V. (BRE) Medhurst, J and Gameson, T. (ECOTEC) 1994. Effects of Pollutants on Buildings. Research Commissioned by Her Majesty's Inspectorate of Pollution. London: Department of the Environment. Clarke, B. and Ashurst, J. 1976. Stone Preservation Experiments. A report prepared for the Department of the Environment. Watford: Building Research Establishment. Clifton-Taylor, A. and Ireson, A.S. 1983. English Building Stone. London: Victor Gollancz Ltd.
Del Monte, M. and Sabbioni, C. 1987. "A study of the patina called Scialbaturta on Imperial Roman marbles." Studies in Conservation 32, 114-121. Ford, B., Macleod, I., and Haydock, P. 1994. "Rock art pigments from the Kimberly Region of Western Australia: Identification of the minerals and conversion mechanisms." Studies in Conservation 39, 57-69. Grant, J. (ed.) 1972. Hackh's Chemical Dictionary. New York: McGraw Hill Book Co.
Janson, H.W. 1974. History of Art. New York: Harry N. Abrams, Inc.
Krumbein, W.E., Peterson, K., and Schellnhuber, H.J. 1989. "On the gemicrobiology of yellow, orange, red, brown and black films and crusts developing on several different types of stone and objects of art." In: International Symposium Proceedings on the Oxalate Films: Origin and Significance in the Conservation of Works of Art. Milano 25 - 26 October 1989, 337 - 347. Lazzarini, L. and Salvadori, O. 1989. "A reassessment of the formation of the patina called Scialbatura." Studies in Conservation 34, 20 -26. Matteini, M. 1987. "In review: An assessment of Florentine methods of wall painting conservation based on the use of mineral treatments." In: Cather, S. (ed.) The Conservation of Wall Paintings. Proceedings of a Symposium Organized by the Courtauld Institute of Art and the Getty Conservation Institute, London, July 13 - 16, 1987. The J. Paul Getty Trust, 137-148. Matteini, M., Moles, A., and Giovannoni, S. 1994. "Calcium oxalate as a protective mineral system for wall paintings: Methodology and analyses." In: Fassina, V., Ott, H. & Zezza, F. (eds.) The Conservation of Monuments in the Mediterranean Basin. Proceedings of the 3rd International Symposium, Venice 1994, 155 - 162. Matteini, M. and Giovannoni, S. 1996. "The Protective effect of ammonium oxalate treatment on the surface of wall paintings." In: Painted Facades. Proceedings of the Eurocare Project, Vienna 1996, 95 - 101. Miller, E. 1993. "Stone consolidation materials." Unpublished paper. British Museum. Mora, L., Mora, P., and Philippot, P. 1984. Conservation of Wall Paintings. London: Butterworth. Morgan, G. 1997. "Plaster analysis and the conservator/restorer." Paper presented at the conference The Analysis of Pigments and Plasters. British Museum, 22 February 1997. Nord, A.G. and Ericsson, T. 1993. "Chemical analysis of thin black layers on building stone." Studies in Conservation 38, 25-35. Price, C. 1993. "Salt damage in monuments and means of control." Paper presented at The Institute of Archaeology, University College London. Price, C. 1984. "The consolidation of limestone using a lime poultice and limewater." In: Adhesives and Consolidants. IIC Preprints of the Contributions to the Paris Congress, 2-8 September 1984. Paris: IIC, 160-162. Quellmalz, W. 1989. "The calcium oxalate Whewellite: mineralogy and natural occurrences." In: International Symposium Proceedings on the Oxalate Films: Origin and Significance in the Conservation of Works of Art. Milano 25-26 October 1989, 103-112. Rosch, H. and Schwarz, H.J. 1993. "Damage to frescoes caused by sulphate bearing salts: Where does the sulphur come from?" Studies in Conservation 38, 224-230. Rossi Manaresi, R., Grillini, G.C., Pinna, D., and Tucci, A. 1989. "La formazione di ossalati di calcio su superfici monumentali: genesi biologica o da trattamenti?" In: International Symposium Proceedings on the Oxalate Films: Origin and Significance in the Conservation of Works of Art. Milano 25 - 26 October 1989, 113-125. Saiz-Jimenez, C. 1989. "Biogenic vs. anthropogenic oxalic acid in the environment." In: International Symposium Proceedings on The Oxalate Films: Origin and Significance in the Conservation of Works of Art. Milano 25 - 26 October 1989, 207-214. Shashou, Y.R. 1993. "Mechanical testing of resins for use in conservation." Preprints of the 10th Triennial Meeting, Washington, D.C. USA 22 - 27 August 1993. Paris: ICOM Committee for Conservation Vol. 2, 580-585. Stone Industries 1994-95. Natural Stone Directory Worthing, West Sussex: Herald House Ltd.
Teutonico, J.M. 1988. A Laboratory Manual for Architectural Conservators. Rome: ICCROM. Torraca, G. 1988. Porous Building Material: Material Science for Architectural Conservation. Rome: ICCROM. Watchman, A.L. 1991. "Age and composition of oxalate-rich crusts in the Northern Territory, Australia." Studies in Conservation 36, 24-32.